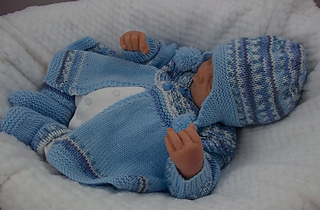 The pattern consists of a round necked traditionally styled matinee type cardigan featuring a mock ‘fairisle’ effect achieved by the clever use of self patterning yarn. 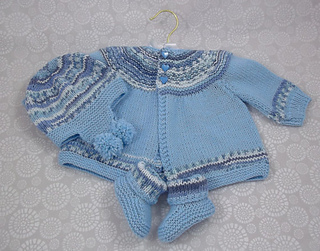 Knitted from the bottom up on two needles using easy to knit stocking stitch (stockinette stitch) and plain knit stitches throughout. 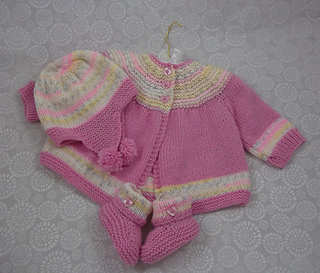 The matching hat and booties are a quick and easy knit but produce a really cute set especially if you decide to add the pom poms to the bottom of each ear flap. Details of shades used in the above outfits are given on the pattern.